Letting Anger Go For a Happier You! Persistent anger can affect your health, causing increased anxiety, high blood pressure, headache and more. But you can defeat anger! Not thinking in Black and White! Physical activity can be surprisingly calming. Walk away by actually walking away! Find happier pastimes. Schedule time in which you can simply relax. Anger does not have to control you. You can control it! Visit your chiropractor and “get adjusted” to anger by having a healthy body for your healthy mind. 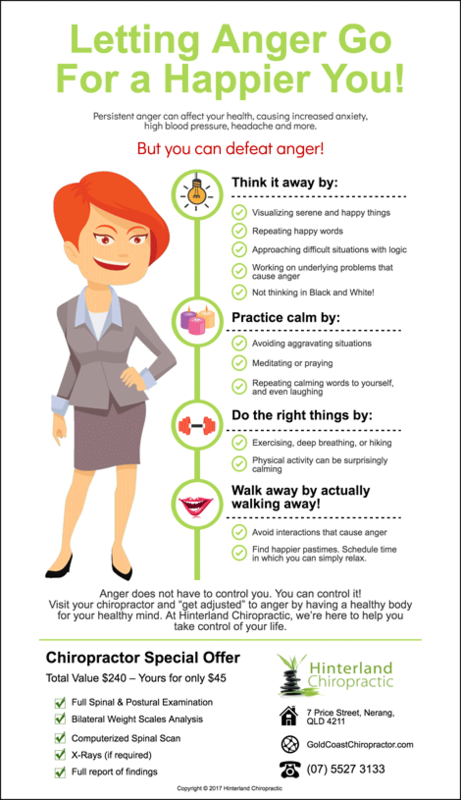 At Hinterland Chiropractic, we’re here to help you take control of your life.